Patches huh? Bet you never took me for a girl for patched on a denim jacket? Well neither did I until this bank holiday Monday when my friend Ana came round and inspired me to start customising our denim jacket with patches together! I made a little wishlist of just some of the patched I'd love to get on my jacket. Ana and I have already started with two matching patches: a flamingo and a Russian doll but it can't end there! We're in it now! So Ana and I spoke about this a lot on Monday. 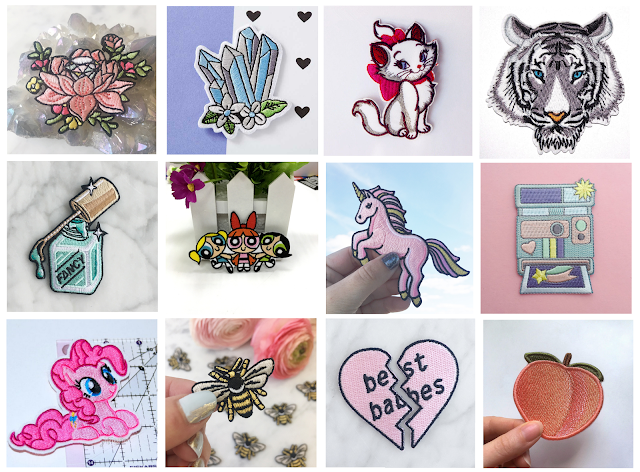 We googled away on Etsy, eBay, Amazon and any other website that might have patches and made a list of all the cute things we could get on them! The idea that we could have these super cool patched up unique denim jackets just sounded so cool and we pretty much got lost in the patch world. After she left I even googled how to make my very own custom ones. I have some ideas and I've got to do them asap! We decided that the patches have to be things we love and represent us and our personality. I feel like not only would all the patches in this wishlist look good together, but they all shout out at me too. Some of them I would pick just because they're cute like the lotus flower and the crystals but then ones like the bee and the camera have to do with my personality and the things I'm into! If you're wondering, my family keep bees and make honey and I love photography. I've even made a Pinterest board for all my inspirations and patch ideas. Ones not on this list that I'd definitely want would be a Pokéball, Jigglypuff, a paint tube, a banana and a doughnut. All for their own reasons. Have you patched up any denim before? What patches would you have? I just bought a new denim jacket and am itching to get patching! I love the Marie patch and the peach they're adorable. Good luck with your patching journey! I still want all of these patches... aren't they the cutest! ?